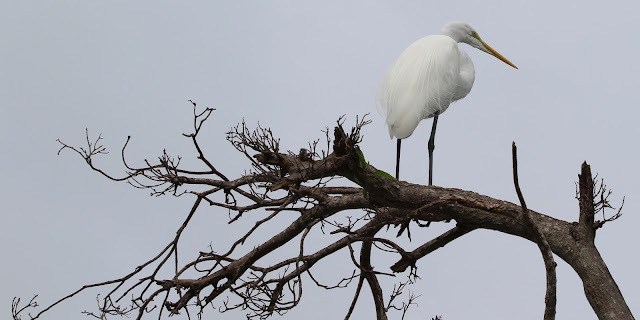 Traveling southwest along Route 1 (hopping islands and transversing open water like Jamie Lee Curtis hanging out an open sunroof), I had tried to shoot birds—with a camera, not a gun. And yes, Robin was driving. There were many along the wires and railings. Mostly cormorants (which I already had), but a few others looked new. It didn’t work. Even at max shutter speed the shots came out as blurs. The sun was going down. And while everyone else was stopping at roadside pull-offs to take pictures of the orange sun setting over the gulf behind perfectly black silhouettes of palm trees (something I'm sure they were doing to create a screen-saver version of a classic Florida postcard) I was lamenting the lack of light which prevented me from shooting birds. Around nine at night we arrived at the place Robin had booked for us: a “boutique hotel” called Eden House. 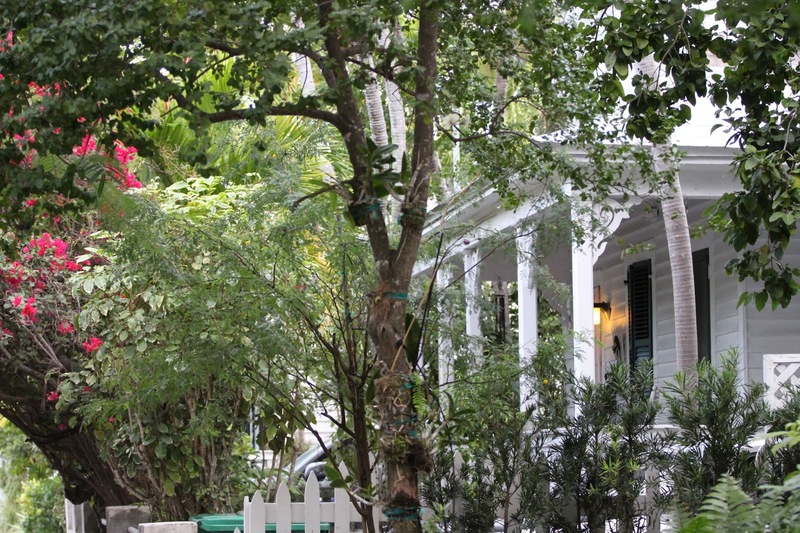 Right in the thick of Key West, the tiny hotel with the walled-in oasis was a lovely setting but not much of a room. It had a bed next to a sink, three hooks on the wall, a tiny fold-down desk, a shower in the corner of the room and a toilet in a closet. No dresser, tv, phone, or much of anything else. Robin, who made the reservation and likes television, wondered if she’d made a mistake. I, who hardly ever watches tv, called it authentic. 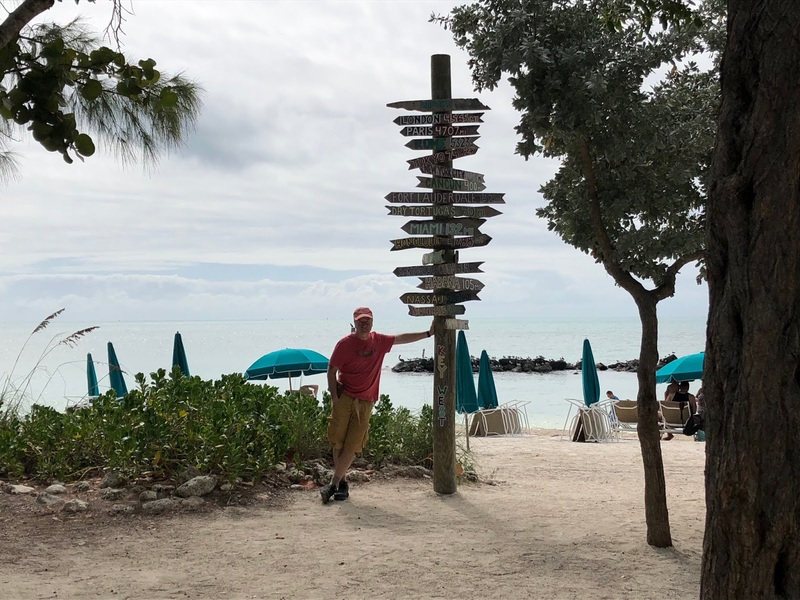 Key West is a different world. The clapboard houses behind white picket fences are wreathed in lush palms and orchids, and they sell for millions. Down on Duval Street, we spotted lavish restaurants with terraces and more gardens. But as we discovered when we lived in Vermont, there is the trendy and then there is the genuine. Nearly all the fancy looking restaurants had average food and terrible service, while the worst appearing eateries, the ones that must have paid off the health department to keep in business, were fantastic. This became our system for finding the best food. If it looked about to be condemned, if the walls were partially built out of old car doors, if birds flew through the dining area and chickens strutted under tables, we knew we’d found a culinary delight. One of the best is Pepe’s. 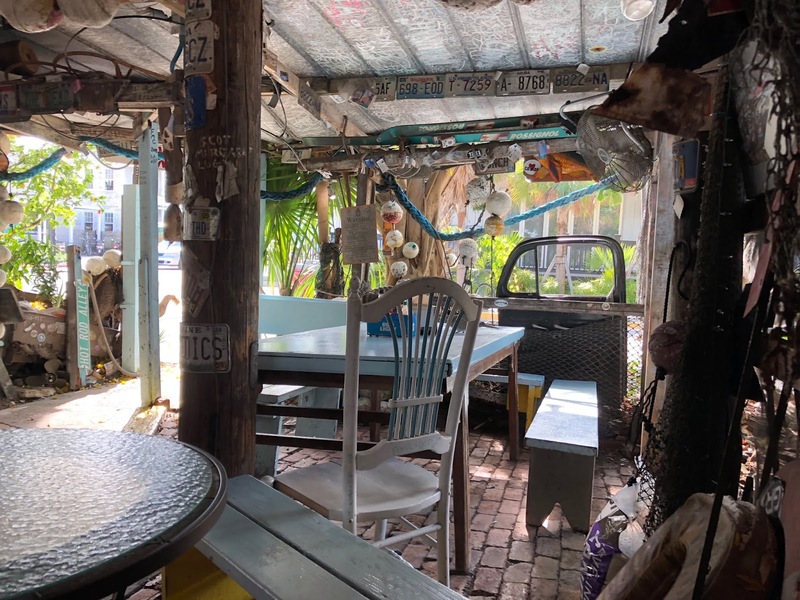 Established in 1909, it looks like a shack but has great food and served the most wondrous Key Lime pie—the best we found on the island. Traditionally, I have always been more of a banana cream or chocolate cream guy, but what I didn’t know was that real key lime pie is different from the knock-offs up north. Real key lime is made with actual Key limes which are quite different in that they are the shape and size of golf balls and have a thin skin and, of course, a different flavor. Pepe’s key lime pie was so shockingly good, so light, flavorful and simple that we went back the next day just to have it again. On that first morning, I got up before dawn and armed with my rifle-like telephoto slung over one shoulder, I wandered the streets. I picked up a new gull and a brown pelican at the marina, and a palm warbler in the historic cemetery. I was excited to shoot my first exotic bird—an ibis. 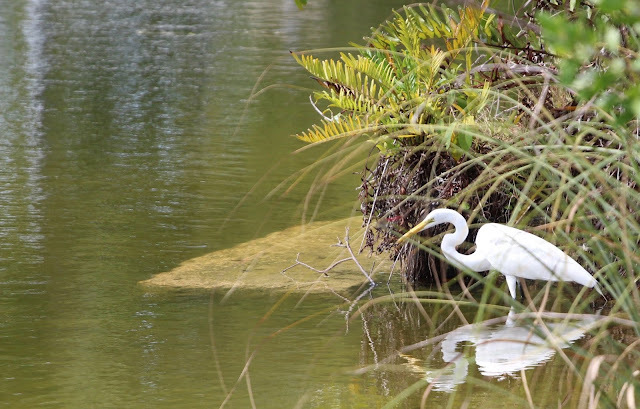 This was the snow white wading bird with the downward curved beak so often seen in ancient Egyptian hieroglyphics. Clicking the shutter, capturing this grand find, I felt like a genuine birder, a master of the hunt. Turned out, in the Keys, Ibis are as common as pigeons in Central Park. I later found packs of them poking through garbage containers in the back of Walmarts. Walking around the island was nice, but I needed to get out in the wild and really hunt. Key West is where Papa Hemingway used to spend time sports fishing. I needed a boat. The brochure said that unless I had skippered a boat on the open ocean at least ten times, I should charter a captain along with a vessel. I never liked the idea of being led around when horseback riding, and I didn’t think I’d like having someone else steer my ship as I hunted birds. After all, that’s one of the reasons I had Sancho. And really, how much trouble could I get into in the open ocean? Okay, maybe there was some risk. So before we took command of the 14’ skiff and headed off into the Gulf of Mexico and the unknown, I bought a bottle of sunscreen. I figured that would do it. Right now you’re thinking…what an idiot. You’re expecting to hear a tale of a fateful trip that ends up with Robin and I stranded on a desert isle with a professor, a starlet, and millionaires who inexplicably brought multiple steamer trunks of luggage on a three-hour cruise. Turns out the Gulf of Mexico (at least the part we explored) isn’t terribly scary. We powered out away from land for over an hour at a pretty good clip toward Snip and Mud keys, and at any point, if we had run out of gas or something awful happened, we could have gotten out and pushed. The Gulf of Mexico, we discovered, is ridiculously shallow. Even at high tide, much of it is little more than three feet deep. Using a nifty nautical app, (that the fella who rented us the boat helped set up on my phone), we navigated out to a sandy beach on Mud Key and had lunch--sandwiches that we picked up at a little bakery near the hotel. Then faithful Sancho took the helm and I perched myself on the bow, camera in hand and we went hunting through the mangrove channels trying our best not to run aground or spook birds. Imagine just about any wildlife documentary where David Attenborough narrates over the muffled sound of a boat motor and there’s this awkward fellow laying across the bow with a massive camera lens in hand, and you’ve seen this part. We tried to reach the Great White Heron Refuge, but the water was simply too shallow and we did run aground in our attempt. “Aye, don’t get your britches in a bunch, Hooper!” Robin growled her best imitation of Robert Shaw’s Quint from the movie Jaws, as she shut the motor to the skiff off and gave me an almost sinisterly mischievous look. “Give it a sec and the wind’ll drift us right off.” Between us, Robin is the real salt. She had a Sunfish sailboat as a girl. Just as Robin prophesied we drifted off, restarted the motor, and headed back. Spray breached the bow as we slammed the crests that came sideways so that I had to hide my camera inside my fleece. 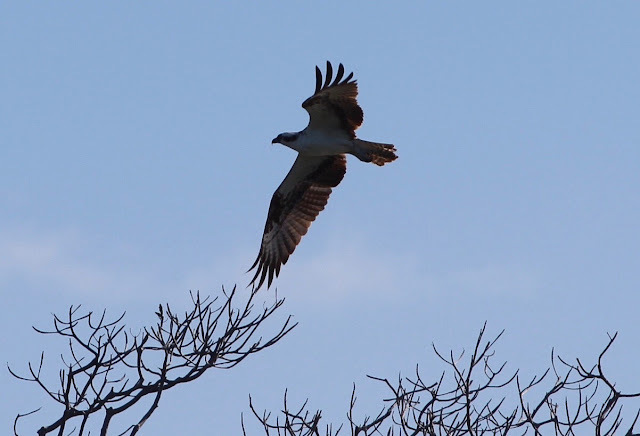 The day was fading and while I had blasted away a bunch of birds that I still needed to identify, there was one I wanted and hadn’t seen: osprey. There it was. The outline of a big bird on the far end of the island perched on the top of a tree. With a wave and a point, I urged Robin to ease over. The sun was against us—behind the bird, meaning all I would get was an outline and that wasn’t good enough. Color and details help to accurately identify. Closer and closer we neared, then we got too close and the bird launched. “Get in there!” I shouted as I opened fire using my auto shoot setting and fastest shutter speed. I didn’t care, and slowly, very slowly, we navigated away from Osprey Isle. 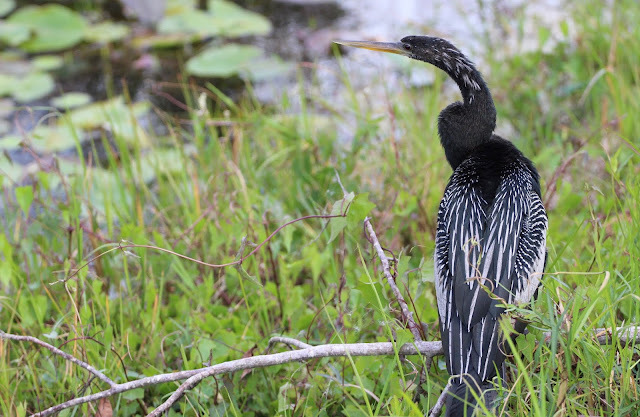 By the time we docked, I had bagged 13 total new birds including a Magnificent Frigatebird. My count was now 57. I was ahead of Sarah by eleven, and we still had three days of hunting left! Thanks for the heads up. That's what I get for writing from memory...especially when your mind is as old as mine is. I updated the post. Thanks for taking us along on your expedition. It was a hard February weatherwise & it was lovely to do a little desk chair travelling to warmer, lusher places. Lovely photos and happy to see you got that Osprey. Thanks! It was exciting to be on the hunt. 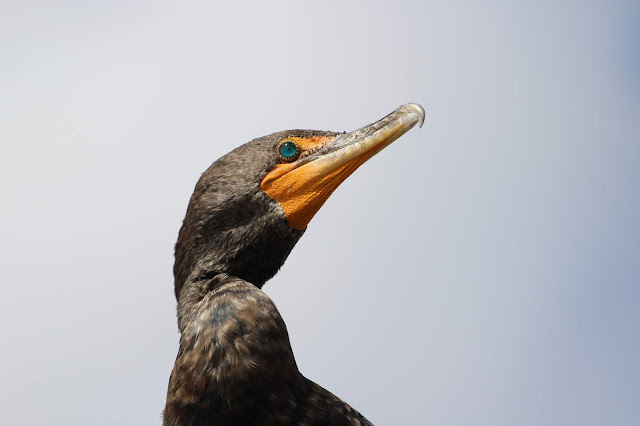 I love that Cormorant photo. It's one of Robin's favorite as well. 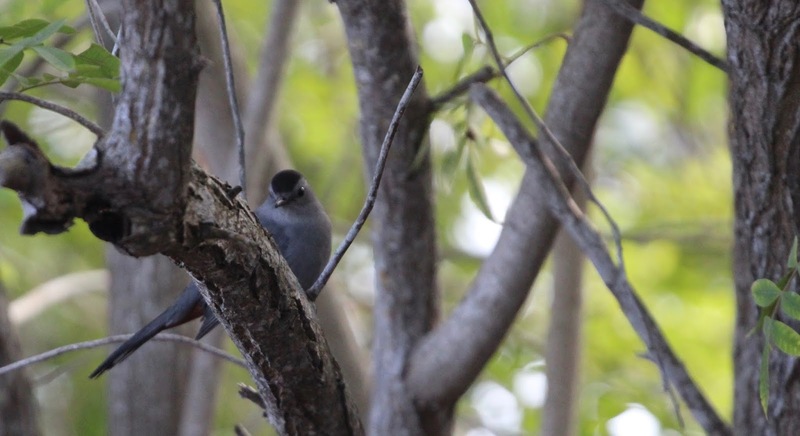 I was actually surprised you caught a shot of the cat bird (specifically the Gray Catbird)! Since I am from North Carolina a lot of people look at me like a have three eyes up in the north when I mention the "song" of a catbird in the area. I have them listen closely then they "get it," most of the time! 8) Congrats on your 7(?) bird lead? How far are you willing to go to win this competition?